The Minutemen story is told through the character of Hollis Mason, the original Nite-Owl, as he prepares to release a tell-all about his days as a crime fighter alongside a team of heroes, called the Minutemen. The story spans from 1939, when the golden age of mystery men started to 1962 where a middle aged Hollis is trying to get his memoir, "Under the Hood," published. Through Hollis, we learn more about these other heroes. While characters like the Comedian and the original Silk Spectre had their back story touched on in the original mini-series, we learn more about the others; Hooded Justice, Mothman, Dollar Bill, Captain Metropolis and the Silhouette. The storyline follows the fate of these characters through Nite-Owl's eyes, filling in the blanks in the original story but with some twists.. Darwyn Cooke both writes and des the art to this book, giving it a golden-age feel, mixed in with a modern comic sensibility. The second collected story is Silk Spectre, written by Darwyn Cooke and Amanda Conner, with art by Amanda Conner. The story, set in 1967, follows Laurie Jupiter, destined to be the second Silk Spectre. Seeking to be free of her mother and her plan to have her daughter follow in her footsteps as a crime fighter, Laurie runs off to San Franciso with a boy named Greg and moves in with a hippie couple. But being a costume hero is in her blood and she finds herself drawn into the life. She finds herself alone against a drug cartel using drugs and music to control. Amanda Conner's art is well done, especially the psychedelic trip sequence in issue 2. 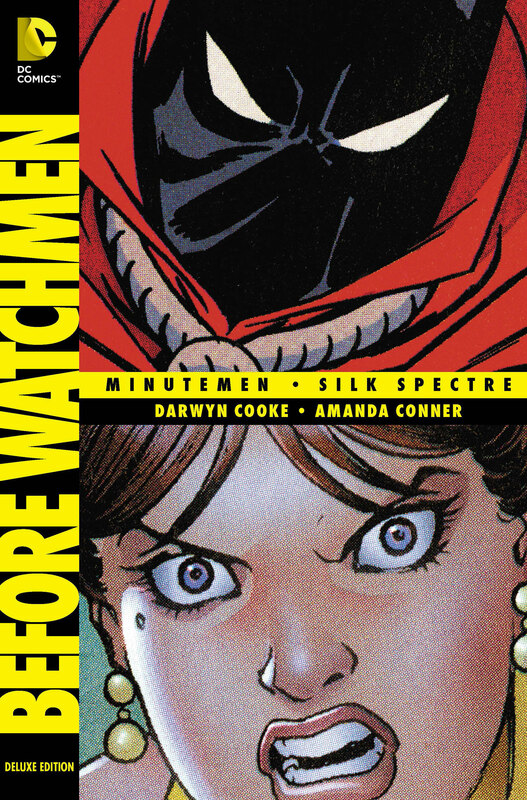 Overall, both stories are good, with Before Watchmen: Minutemen being the stronger of the two. With a larger time frame to tell the story and multiple characters to flesh out, it adds more to the characters it features. Before Watchmen: Silk Spectre, while good, does not really add much to the character of Laurie or her relationship with her mother. Any new characters introduced are just throwaways, especially the love interest, as Laurie's career as the Silk Spectre is pretty much covered in the Watchmen series as is her relationships with Doctor Manhattan and Nite-Owl 2 later on.